Created by Philadelphia’s hip-hop groups The Roots, the eighth annual Roots Picnic is back for another year. The event ,which takes place on Saturday, May 30, at Philly’s Festival Pier in Penn’s Landing features Erkyah Badu, the Weeknd, A$AP Rocky, Rae Sremmurd and the legendary leader of funk Afrika Bambaataa. Cost: General admission $81.75 (including all taxes and fees) on Ticketmaster. With an incredible lineup such as Drake, the Black Keys, Lana Del Ray and DeadMau5, if you’re into different genres of music.No concert snobs at this show—it’s fun for everybody. Cost: Three-day general admission passes are $260. Just note: there are online purchase fees and shipping fees. The Atlanta Greek Picnic weekend is the #1 yearly event amongst 9 other similar events across the country designed to provide members of the prestigious Divine Nine Greek letter organization a unique experience that caters to them. This event has grown from its subtle beginnings to becoming the most popular destination and focal point for all Greek Chapters, Line Brothers, Line Sisters and Sands to reunite and socialize for one exciting weekend of unity, Service and bonding. The 23rd annual Capital Jazz Fest takes place June 5-7, 2015 at Merriweather Post Pavilion in Columbia, Maryland and will feature nearly 30 national acts on two big stages., including Chrisette Michele, Eric Benet, Meshell Ndegeocello, India Arie and Maze featuring Frankie Beverly, plus a “Catch a Rising Star” showcase of new talent. Kendrick Lamar, Chris Brown, Trey Songz, Big Sean, Meek Mill, Fab & Friends, Childish Gambino, Omarion, Ty Dolla $ign, Travi$ Scott, B.o.B, Joey Bada$$, DeJ Loaf, Teyana Taylor, Fetty Wap, and Charles Hamilton will be hitting the iconic hip hop concert’s stage. The American Black Film Festival is a four-day event dedicated to showcasing stories by and about people of African descent.Four days of films, panels, parties and more…from the star-studded opening night screening to the closing “Best of the ABFF” Awards Ceremony. Cost: Individual Passes go on sale May 15th. Day passes starting at $150. The largest African American street festival on the east coast with 500,000 people, over 12 city blocks, and two stages of live entertainment. An annual free celebration of life, music, and culture. It includes stellar performances, empowerment seminars, and non-stop fun for the entire family. Only have time for a weekend of ratchetness? This pre-BET Awards event will get you right with Kevin Hart, Nicki Minaj, Ice Cube, The Roots, and Miguel. In its 21st year, the Essence Festival will feature performances from Kendrick Lamar, Mary J. Blige, Common, Erykah Badu, Teedra Moses, Robert Glasper and Tweet. Henny Palooza and LIV (formerly Gemini Dream Weekend) have partnered to host Wet Dreams “The All White Pool Party” in beautiful Bermuda. Henny Palooza started as a small gathering of friends but has transformed into an international house party featuring Hennessy, of course. New York City’s largest Hip-Hop cultural event that showcases the positive aspects of Hip-Hop culture. This year’s headliner is Oscar winner, Common. Taste of Chicago is the nation’s premier outdoor food festival showcasing the diversity of Chicago’s dining community. The delicious array of food served at Taste of Chicago is complemented by music and exciting activities for the entire family. The Greatest Day Ever is an all-day carnival cross-genre musical event and party. Summer Sizzle BVI hosted by Empire star Taraji P. Henson, offers an escape to the Caribbean, combining fashion, decadent parties, island tours, sailing excursions and more. The ultimate business conference for women of color in communications. Innovative programs, presented by the industry’s top practitioners and thought leaders, will address key issues and predict future trends. An inspiring and empowering conference that will provide you with unmatched professional, civic engagement, business development, and networking opportunities. Enjoy a uniquely curated, 5-star immersion into Napa Valley culture with private vineyard tours, wine tasting, golf, yoga, live music, spa, comedy and culinary delights prepared by renowned chefs. Yes two cities, at the same damn time! No official word on the line-up tho. Two sensational days of music, food, fun and art in beautiful downtown Oakland. Don’t act, you know you love you some Drake. October’s Very Own will host his 6th annual OVO Fest in his hometown Toronto. Everyone’s a writer, right? Make some journalism connects at the National Association of Black Journalists (NABJ)’s annual event. Founded by North Carolina-based Floyd and Stephanie Rance of Run and Shoot Filmworks, MVAAFF will present films by African-American directors from around the world. AfroPunk itself has become synonymous with open-minded, non-conforming and unconventional, placing the institution at the epicenter of urban culture inspired by alternative music. 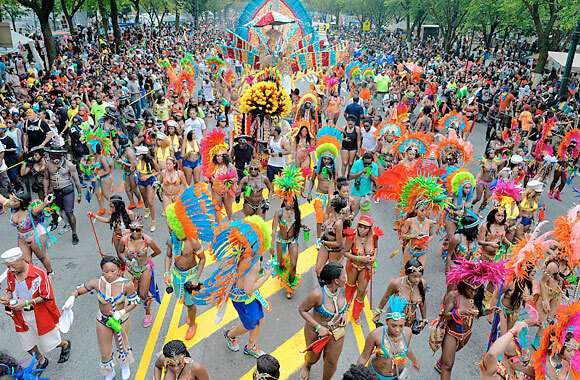 The annual West Indian–American Day Carnival draws close to two million people to Crown Heights in Brooklyneach year. During the seven-hour New York carnival, steel-pan and calypso bands in elaborate costumes march down Eastern Parkway, and vendors sell homestyle island grub along the route. The pre-parade festivities begin before dawn with J’ouvert (“daybreak” in French), a festival held before the main event.